No one on No. 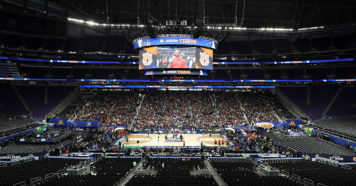 1 Kansas’ roster may benefit more from the addition of Memphis transfer Dedric Lawson than junior center Udoka Azubuike, who will start alongside Lawson in the Jayhawks’ frontcourt this season. Kansas held on for a 92-87 win over No. 10 Michigan State in its season opener in the Champions Classic on Tuesday. For the first time in his college career, Azubuike, listed a 7-feet and 270 pounds, will consistently play alongside another elite big man. In the last two years, Kansas coach Bill Self has relied on guard-heavy, four-around-one lineups. While the Jayhawks have the roster flexibility to go small if a matchup calls for it, they’ll start games with two traditional big men, which has traditionally been a staple of Self-coached Kansas teams. 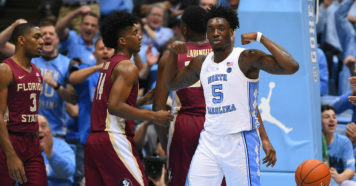 Lawson had the best stat line of any player in the Champions Classic undercard, scoring 20 points with 14 rebounds and six assists, while Azubuike had 17 points on 7-of-10 shooting. 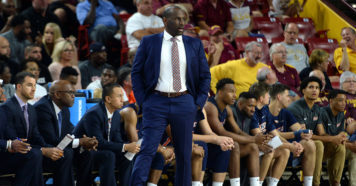 Opposing defenses will have to play both Lawson and Azubuike straight up without double teams, unless they want to risk leaving a preseason First Team All-American (Lawson) or the 2018 NCAA Division I leader in field goal percentage (Azubuike) wide open. Azubuike shot 77 percent from the floor last season. On Tuesday, he showed why he could even better looks this season. 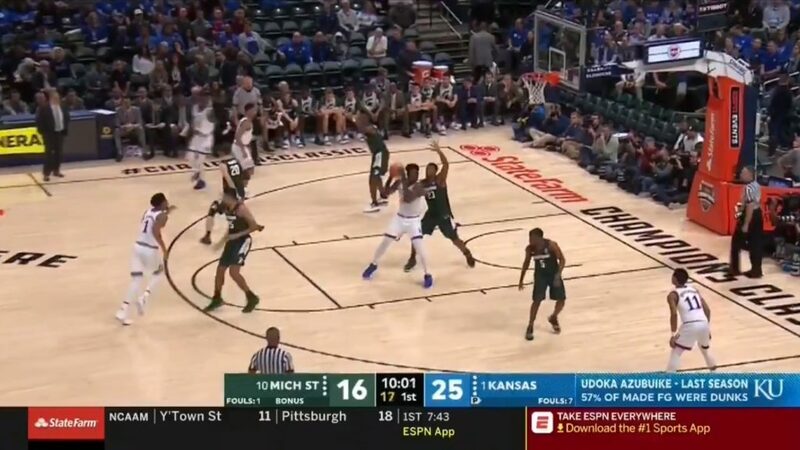 Early in the first half, Azubuike received an entry pass on the right block, where Michigan State’s Nick Ward defended him in the paint. 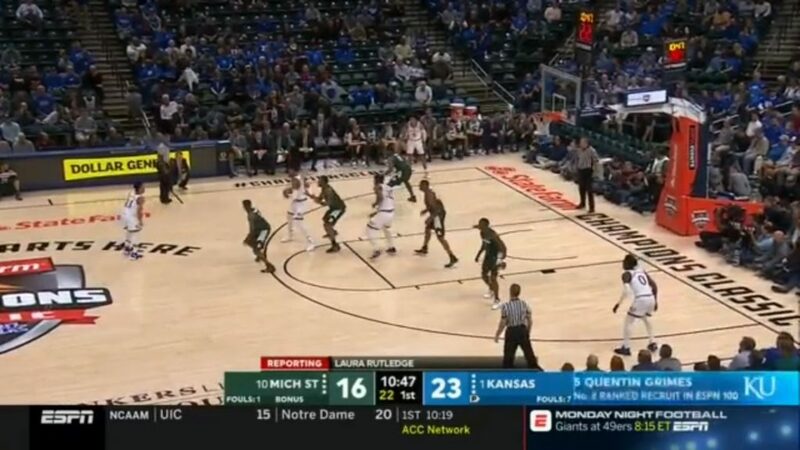 Azubuike spun towards the baseline, then back towards the lane, pump-faking to get Ward to jump. 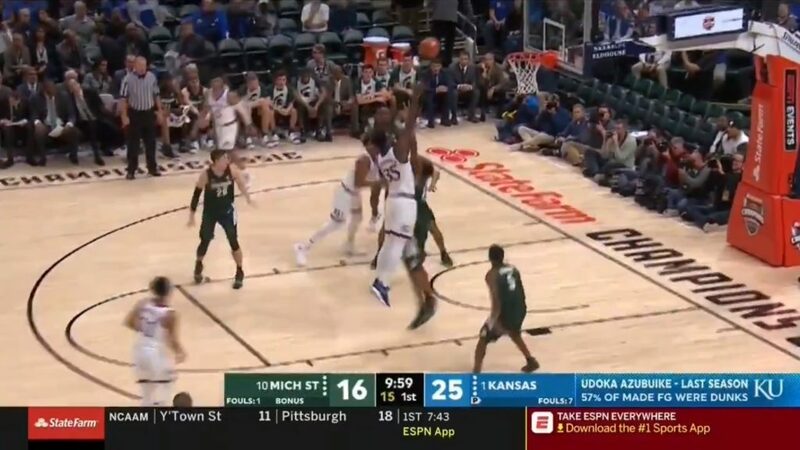 Azubuike ducked under Ward’s arms for an unconstested layup off the glass. Azubuike and Lawson showed off their potential high-low, big-to-big passing on this sequence midway through the first half. 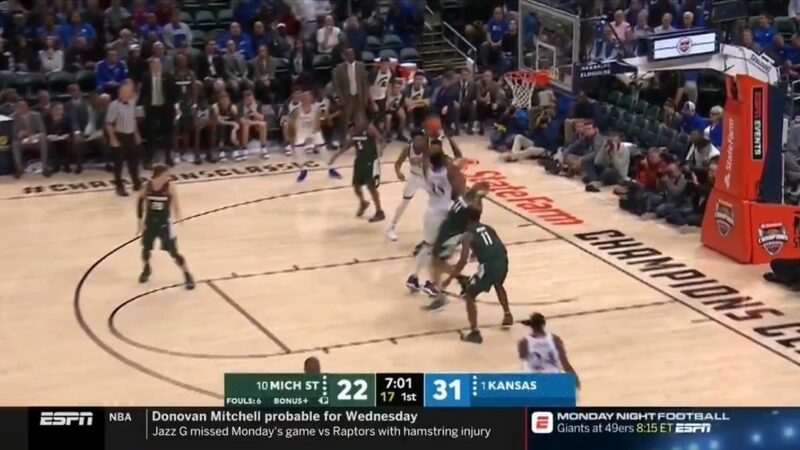 With Lawson holding the ball between the free throw line and three-point line, Azubuike went to screen Lawson’s defender, Michigan State’s Xavier Tillman. 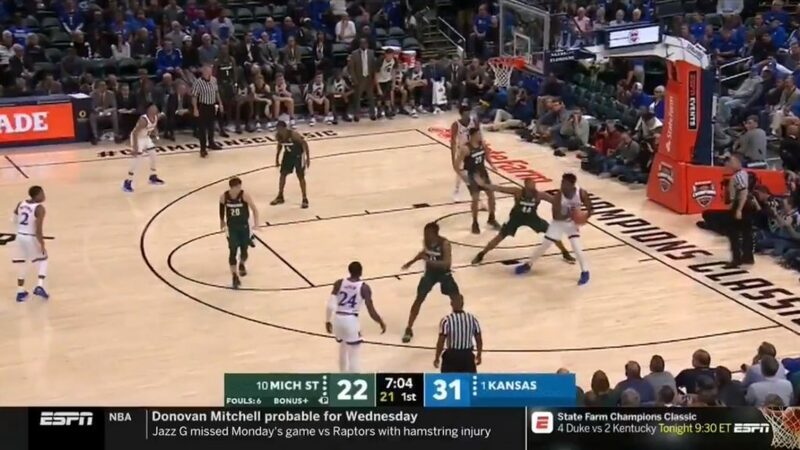 Azubuike quickly rolled to the rim, while Lawson used the screen to create separation from Tillman. He took one dribble, drawing the attention of Azubuike’s defender, Ward, who slid over in the lane to cut off Lawson. 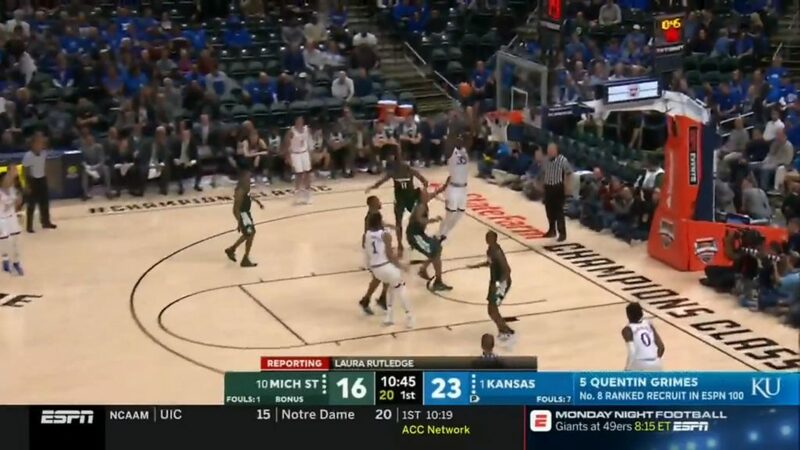 Lawson threw a lob to Azubuike, who had a clear path to the rim for an alley-oop. 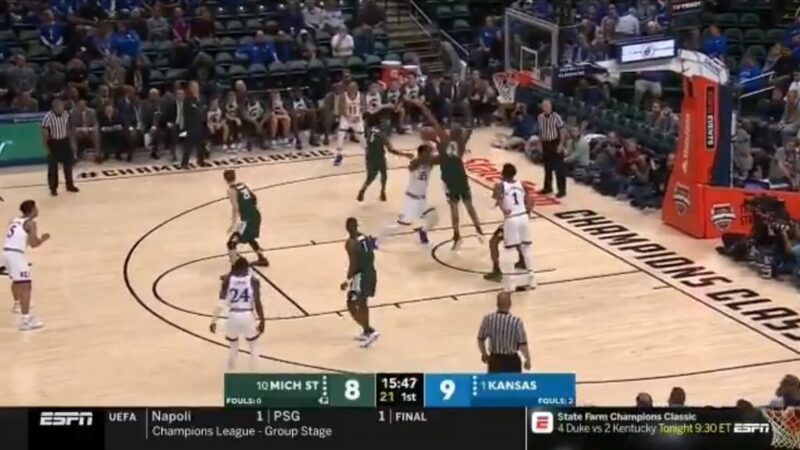 Given his size, skill and footwork down low, Azubuike’s range is almost exclusively limited to within six to eight feet of the basket. Here he showed the range of his jump hook after receiving an entry pass in the middle of the paint. 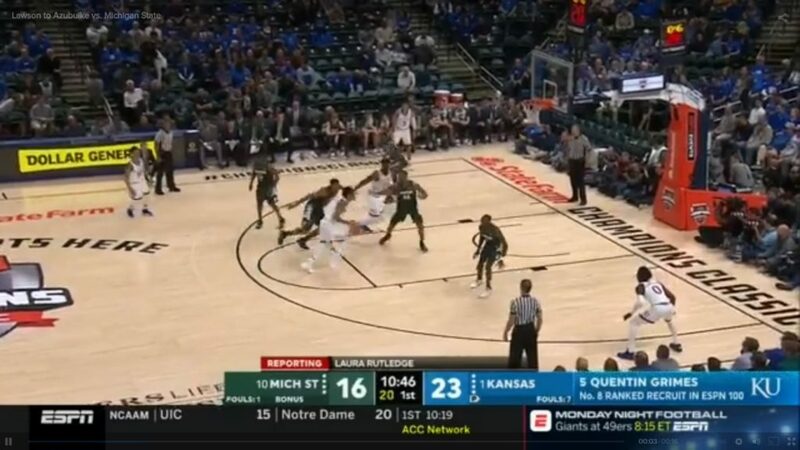 With his back to the basket, Azubuike turned and faked like he was going to drive to his right, getting Ward off balance, as you can see below. Azubuike then turned back to his left, getting the ball in his dominant right hand and jumping over the 6-9 Ward for a jump hook. 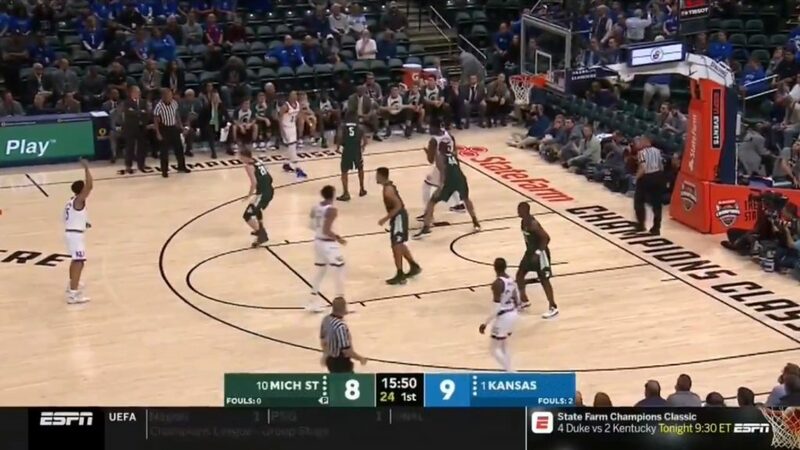 Later in the first half, Azubuike set up on the left post, where he was able to blow past Ward even when Michigan State’s defense collapsed on him. 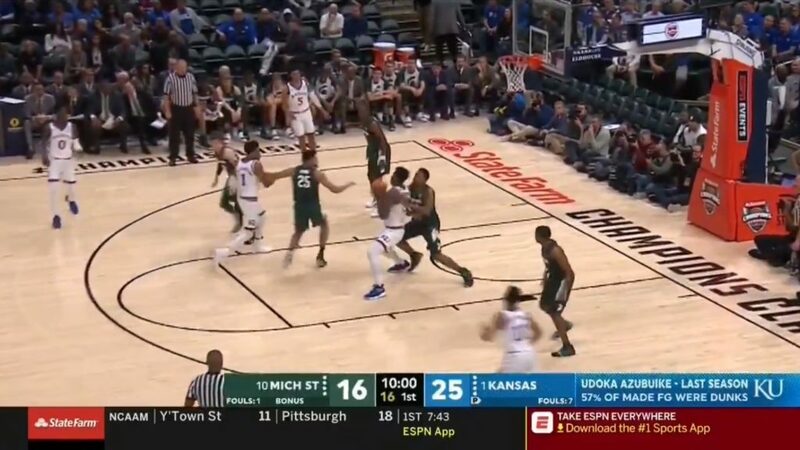 Azubuike made a hard turn into the lane, using his inside elbow and shoulder to seal off Ward as he made his move to the basket. In the first half alone, Azubuike had multiple sequences where he blocked a shot on one end of the floor, then scored or assisted on the other end. Ward, the big-bodied veteran who lined up across from Azubuike, was held to nine points on 2-of-8 shooting, including an 0-for-5 start. 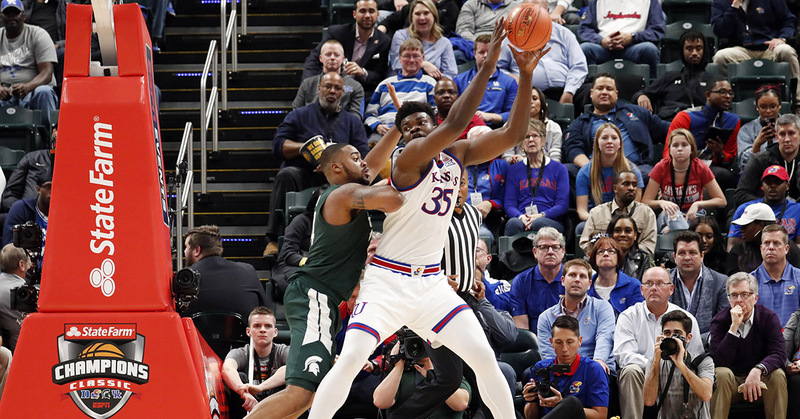 Kansas’ three-point shooting against Michigan State (10-for-23) and Lawson’s production showed how dominant Azubuike can be down low this season with the Jayhawks’ offensive spacing created by the defensive attention also required to his teammates. Bill Self is able to play two true big men together once again and there may not be a better power forward-center combination in the country than the one the No. 1-ranked Jayhawks debuted on Tuesday.